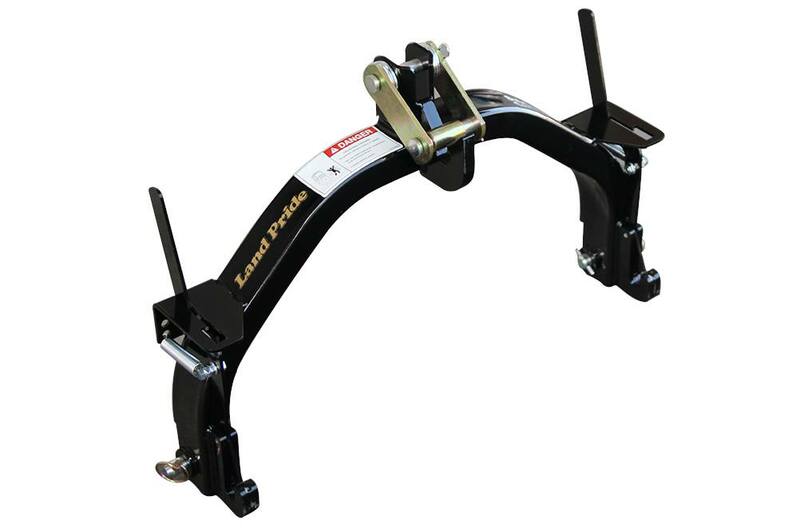 Land Pride’s new QH05 Quick Hitch is specifically engineered for sub-compact tractors. The QH05 allows you to quickly connect to or disconnect from over 20 Land Pride products – most without leaving the tractor seat. Owners of sub-compact tractors will find that the Land Pride QH05 speeds implement changes, allowing more time to get chores completed. Manufactured from 2" x 3" x 3/16" steel tubing, the QH05 is designed and rated for implements weighing less than 700 lbs., 24" from the hitch. * Automatic locks on the lower 3-point arms make hook-up a breeze. Spring-loaded levers make unlocking the lower pin equally as easy and can be done from the tractor seat most of the time. The optional floating top link is required for Land Pride implements with a swiveling top hitch to keep it from binding when going through ditches or other undulations. Weighing less than 40 lbs., the QH05 is simple to install and even easier to use. After installation on your sub-compact tractor, simply line the QH05 up with the Cat 1 hitch on your implement, making sure that the hitch is lower than the implement hitch, and back up. Once the hooks are centered below the pins, raise your 3-point arms. The lower pins automatically lock in place, securing the implement to the tractor. Standard lower link pin size: 7/8" Cat. l pin size. Design fits variety of Land Pride products: Useful time saver when working on multiple projects. Optional floating top link: For implements that have a swiveling top link. Automatic lock on lower 3-point pins: Lower pins on implement lock into place, no need to get off tractor. Cost effective versatility: Only one unit needed per tractor and implement. No separate piece for the implement side. Weight without floating top link: 37 lbs. *Indicates a S/N break designated for QH05. Reference product page for details.